Coal India Limited (CIL) envisaged taking up 129 new coal mining projects for an ultimate coal production capacity of 458 million tonnes per annum during the XII Five Year Plan. Out of these, 21 projects have already been approved and 20 have been approved in-principle. A contribution of 87 million tonnes is envisaged from new projects in 2016-17 and 182 million tonne in the year 2019-20. 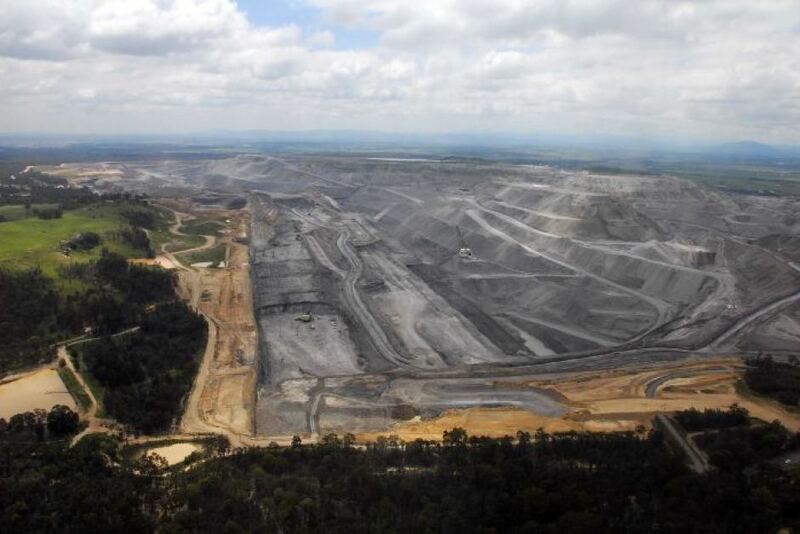 This additional coal production is envisaged to improve availability of coal. This was stated by Sh. Piyush Goyal, Minister of state (IC) for Power, Coal & New and Renewable Energy in a written reply to a question in the Rajya Sabha today. The Minister further stated that however, coal can be imported freely as it is under open general license. An Inter-Ministerial Committee (IMC) has been constituted in the Ministry of Coal on 12.01.2015 to consider various models including auctioning of coal linkages/LoAs through competitive bidding as the selection process and to recommend the optimal structure that would meet the requirements of all the stakeholders. This was stated by Sh. Piyush Goyal, Minister of state (IC) for Power, Coal & New and Renewable Energy in a written reply to a question in the Rajya Sabha today. The Minister further stated that in order to conduct the auction of the Coal Linkages to non-regulated sector which covers Cement, Sponge Iron, Captive Power and others through competitive bidding this Ministry has prepared a draft auction methodology and also an approach paper has been prepared for public consultation. On 04.06.2015 the members of the public and stakeholders concerned were requested to submit their comments/views on the draft auction methodology. The policy for linkage auction is under consideration of the Ministry, the Minister added. In the year 2014, a total of 6 cases of theft of antiquities have been reported from Centrally protected monuments/Sites/Museum maintained by the Archeological Survey of India. Similarly in the year 2015 till date, 2 such cases have been reported. Under the Antiquities and Art Treasures Act 1972, provisions exist for regulating the trade in antiquities and for registering specific categories of antiquities. The National Mission on Monuments and Antiquities would document the antiquities and prepare a national database, which would help in establishing provenance in the retrieval of smuggled antiquities. The Mission would also promote public awareness, concern and participation in safeguarding of antiquarian wealth. This information was given by the Minister of State for Tourism (Independent Charge), Culture (Independent Charge) and Civil Aviation, Dr Mahesh Sharma in reply to an unstarred question today in Lok Sabha. 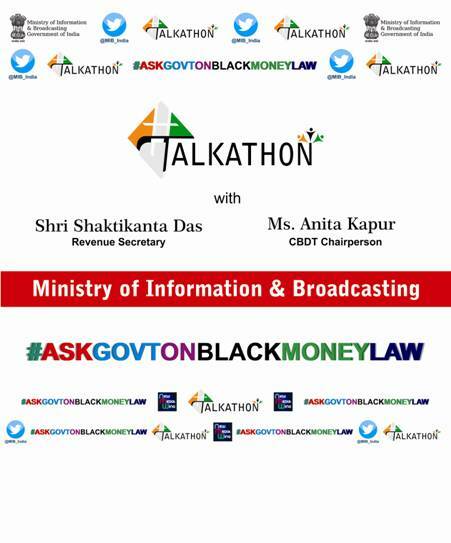 The Revenue Secretary, Shri Shaktikanta Das and Chairperson CBDT, Ms. Anita Kapur would participate in a Talkathon tomorrow i.e. Tuesday, 4th August, 2015 from 7 pm onwards on the theme of New Black Money Law. Talkathon is being organized by the Ministry of Information And Broadcasting. The entire show would be broadcasted LIVE through the YouTube channel of Ministry of Information & Broadcasting i.e. www.youtube.com/user/INBMINISTRY. It will also be telecast Live by DD News Channel. Talkathon is a unique initiative by the Ministry of Information and Broadcasting, where virtual space merges with the real world. 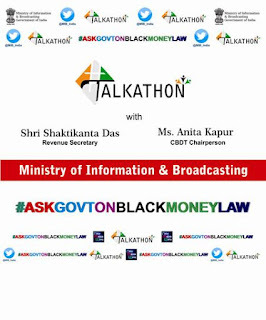 Talkathon provides a platform for twitter users/ twitterati to ask questions directly to guest/s on twitter using a specific hashtag: #ASKGOVTONBLACKMONEYLAW . The previous editions of Talkathon were well appreciated both in the real and virtual space. This year’s Union Budget 2015-16 became a watershed moment, as the Union Finance Minister Shri Arun Jaitley answered various questions asked by public directly on twitter using hashtag #AskYourFM. The one hour interaction was hosted by celebrity author Shri Chetan Bhagat and telecasted Live on Doordarshan and I&B Ministry’s YouTube channel. Talkathon on the completion of one year of the present NDA Government with the three Union Ministers, Smt Smriti Irani, Smt Nirmala Sitharaman and Shri Piyush Goyal was also a great success. The Appointments Committee of the Cabinet has approved the continuation of additional charge of the post of Enforcement Director under Department of Revenue assigned to Shri Rajan S.Katoch, IAS (MP:79) for a period of three months beyond 31.7.2015. In exercise of the powers conferred by article 223 of the Constitution of India, the President is pleased to appoint Shri Iqbal Ahmed Ansari, senior-most Judge of the Patna High Court, to perform the duties of the office of Chief Justice of that High Court with effect from 1st August, 2015 consequent upon the retirement of Shri Justice Lingala Narasimha Reddy, Chief Justice of Patna High Court. The Government facilitates the promotion and development of MSMEs in the country including North-Eastern Region by improving access to finance through implementation of Credit Guarantee Scheme, Performance and Credit Rating Scheme, etc. and supporting technology development through implementation of various schemes/programmes like Credit Linked Capital Subsidy Scheme, National Manufacturing Competitiveness Programme etc. The Government is implementing Prime Minister’s Employment Generation Programme (PMEGP) in the country including North-Eastern Region to facilitate generation of employment. The Margin Money Subsidy released during the current year (as on 16.07.2015), for North-Eastern Region under the PMEGP is Rs. 108.01 Crores. There are four MSME-Development Institutes (DIs) located at Guwahati, Agartala, Gangtok, and Imphal with their Branch institutes in the region. This information was given by the Minister of State, Micro, Small & Medium Enterprises, Shri Giriraj Singh in a written reply to a question in Lok Sabha here today. Government has developed a portal “Employment Exchange for Industries” having URL: www.eex.dcmsme.gov.in. (State / UT wise details of job seekers registered on Employment Exchange for Industries as at 3:53 pm of 28th July 2015). The portal has been launched on 15.06.2015 and no such data is available. To enhance its utility and access for skilled manpower, the portal is being popularized through print and electronic media as well as by approaching industries / associations and pass out & current trainees of MSME Technology Centres. Financial support to participate in State/District level local exhibitions/trade fairs is provided under the Scheme. A platform to bring Buyers and Sellers together for business promotion. Financial assistance to Micro and Small enterprises to participate in overseas exhibitions and to implement Bar Code. * No targets are fixed under schemes since these schemes are demand driven.